Want to get more mobility and efficiency in your wheelchair and you’re looking for wheelchair power packs in Chester? These little products which can easily be attached to manually operated wheelchairs help the care-giver or attendant to easily maneuver the chair through difficult terrain, inclines or slopes. They give more control and assist in adding more power to the chair so it becomes easier to move. These power packs are generally used on a temporary basis. However, in case the user wants the chair to be powered all the time, other options like mobility scooters or powered chairs are a better choice. 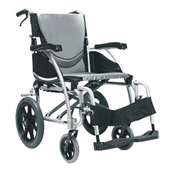 In Chester, wheelchair power packs are available from a variety of manufacturers and dealers. They provide extra force to wheelchairs and allow care-givers to exert minimum strength. This is especially helpful in the case of elderly couples or when the wheelchair bound person is large and/or heavily built. For those who operate the chair themselves, the power packs provide that additional torque when they need to ride up slopes or through traffic. This saves them from putting in too much effort and straining the arms and shoulders. Power packs are installed by fitting two mounting brackets on both arms to hold the motor unit and battery packs. They can be easily attached and detached for charging, repair or replacement. Variable speed settings, twin wheel drive, security locks, removable battery pack for remote charging etc are some available options. Wheelchair power packs in Chester are supplied and installed by reputed firms like Easi-Way Mobility who also sell TGA mobility products. These products assist users in all aspects of daily living that will certainly enhance the quality of life of users, regardless of ability or life-style. Lightweight wheelchair power packs are a great aid to increasing the person’s mobility, confidence and self-esteem. They also safeguard users from health hazards like rotator cuff syndrome, strain on arms and back etc. They’re easy to carry on board aircraft or train and can be charged like cell-phones. Depending on the severity of the disability and the preferences of the users, there are different options available. Contact Easi-Way Mobility today for more information.